Miranda Hart. Work In Progress. In Australia. Live. A sense of sheer excitement filled the air around the Seymour Centre with giggles as we fans mingled in the foyer. Teenagers had homemade fan shirts with MIRANDA and STEVIE scrawled on the front. Gay men gathered in what can only be described as ‘tidy’ gangs; flutters of tight jeans, hipster glasses and hair product. Elderly couples discussed the weather over a glass of wine. My family of eleven sprawled over tiny tables, speculating show moments and crowd watching. Miranda Hart was first introduced to Australia on her sitcom MIRANDA; it’s three seasons airing on ABC sporadically. Last year we saw her acting as Chummy in the BBC’s Call The Midwife. Yet her connection with us transcends the small screen time and lack of local marketing; her first Australian tour Work In Progress will be to a full house and sold out shows. As I sat amongst the 500 strong audience in her second show of the tour, I felt like I was amongst friends. We knew her catchphrases (releasing squeals of delight at “Such Fun” and “Moist Plinth”) and we revelled in her new material (“I need my own designated area, because I’m smoking hot”). She was our Beyonce, in every sense. The show starts with lights out and a famous voiceover introduction done by none other than Miranda herself. She dances onto stage (an energy that builds as the show progresses) and breaks down the nervous audience anticipation by inviting us all to a party, happening right now. She demands a party-anxiety free cocoon (great word, cocoon) where everyone can dance how they want to, fart when they walk up stairs and act like 3-6 year olds without judgement. You are beautiful as you are, is her genial message, and we all laugh at the unrealised idealism. We are involved as an audience to varying degrees. Miranda handed out party snacks (free from annoying cocktail sausage sticks!) to the front row and encouraged a Gloria Gaynor Sing-A-Long. She orchastrated a posh British party, with us as the variable ingredients (“Such Fun”, “Down Boy!”, “Anyone for sherry?”) and in a move of comedic genius, set up a couple on a blind date during the interval. Yes, you read correctly. The lone single straight man in the audience, Alex (“Best personal trait?” “Err… video games?”) was matched up with a younger, Australian Miranda (“What’s the first thing you notice about Alex?” “Well… he’s a man”) on stage, creating MAlex, a hilarious matchmaking moment for our viewing pleasure. They were sent backstage holding hands during the interval, after which we were delighted with uproarious self-referential happy snaps of their date. The power of this moment for me, was in Miranda’s natural comedic ability. Clearly unscripted, her witty observations of human behaviour brought the house down. The unpredictable nature of audience participation allowed for humour to flourish in it’s most natural form. When interviewed after their date, MAlex revelled they had similar interests in shooting… and they were both Christians! The beautiful un-orchestrated juxtaposition of concepts was the cherry on my favourite cake of the evening. I was impressed by the clever build up of jokes in the show. The foundation for self-referential jokes was being laid from the first moment Miranda danced onto the stage, with some concepts coming full circle in the final minutes of the show. I appreciated how much thought went into the production; this wasn’t just a straight stand up routine, it was an event that wouldn’t be the same without me. I won’t spoil anymore of Work In Progress, billed as a warm up run for her UK tour, My, What I Call, Live Show but I will applaud Miranda’s positive vibes. No jokes were made at the expense of others and this was truly refreshing in today’s negatively drenched comedy scene. 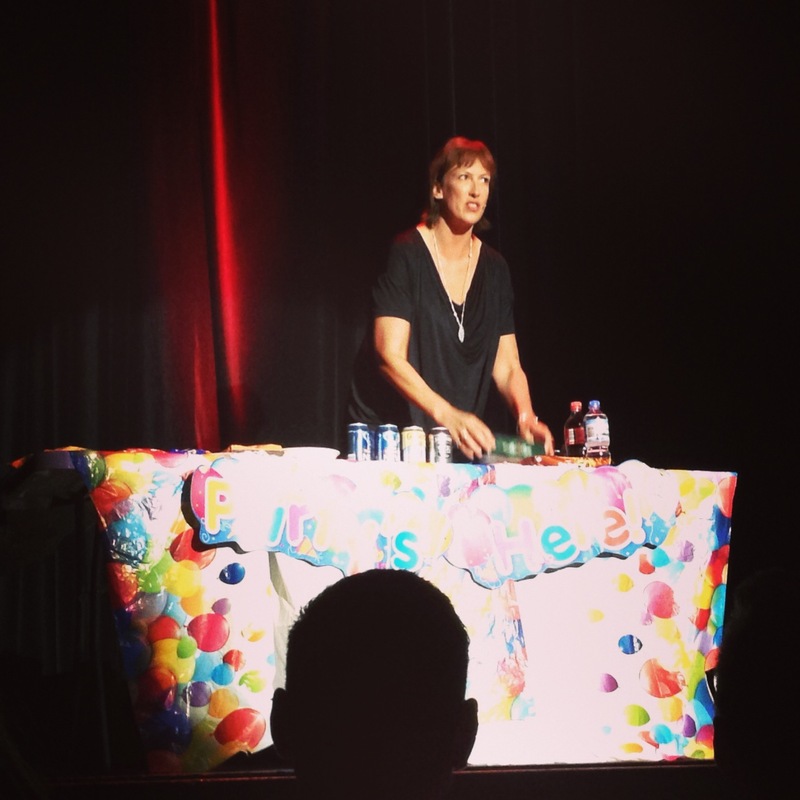 Miranda Hart shared her stories, soul and sense of humour with us inside the Seymour Centre that night. I am sure she will continue the tour with great success and such fun! Well said . I conquer !